This chilled midsummer cherry beet borscht is full of flavor and rich in color, and it blends the taste of Bing cherries with the beets seamlessly. You can cook the beets 3 days in advance, and store in the refrigerator until ready to use. Click here for some tips on how to cook fresh beets. Cook the beets in water in a large saucepan until they are tender enough to pierce with a knife, about 40 minutes. Drain the beets reserving 1 cup of the cooking liquid. Set the beets aside to cool. Put the cherries in a medium saucepan along with the reserved beet liquid. Bring to a simmer over medium-high heat, and simmer until the cherries are very soft, about 10 minutes more. Peel and quarter the beets. Place them in a food processor along with the cherries and cooking liquid. Puree the mixture and transfer to a large bowl. Refrigerate the soup until thoroughly chilled, at least 3 hours. 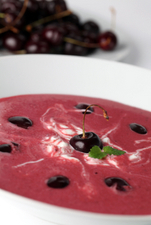 In a separate mixing bowl blend the yogurt and sour cream, and stir them into the beet and cherry puree before serving. Borscht will hold in the refrigerator for up to 3 days. It is a good source of fiber, vitamins and calcium. Use nonfat sour cream and yogurt in this beet borscht recipe for a low calorie meal. Adopted from The Essential Vegetarian Cookbook by Diana Shaw.